Travel through Myanmar and Explore the journey by visiting Yangon the Former Capital of Myanmar, Mandalay , Lake of Inle, Temples of Bagan, Mt. Popa and Finally on the Beach to Relax. Arrive Yangon 2 Nights > Flight Mandalay 3 Nights > Cruise 1 Nights > Bagan 3 Night with excursion to Mt Popa > Flight To Inle lake 2 Nights > Flight to Thandwe to Ngapali Beach 3 Nights > Flight To Yangon 1 Night & Leave. Yangon, formerly known as Rangoon, is a relatively quiet and charming city. Its impressive colonial and spiritual heritage makes it one of the most fascinating cities in Southeast Asia. After breakfast at the hotel, your journey begins with walking downtown to explore the city centre and its fabulous mix of architecture and sites. The streets are filled with historical buildings many of which have a faded colonial charm not seen elsewhere in Asia. Then, visit Kandawagyi Park, one of central Yangon’s greenest spots. Here you will see the glittering Karaweik barge, a replica of the royal barge. Continue to Kyaukhtatgyi Pagoda, which houses a 70-meter reclining Buddha. Late this afternoon, visit Shwedagon Pagoda the most revered Buddhist temple in Myanmar. Although the origins of the pagoda are unclear, it is believed that the original structure was built in the11th century then renovated several times until taking its current shape in the 15th century. The 8-sided central stupa is 90 meters tall and gilded with gold leaf and is surrounded by 64 smaller stupas and your guide will show you around the massive complex, explaining why this temple is so revered. Enjoy breathtaking views of the golden stupa and the city skyline from this vantage point. After breakfast you are transferred to Yangon Airport to board flight for Mandalay. Upon arrival in Mandalay you are met and transferred to your pre booked Hotel. Later begin your sightseeing tour of Mandalay with a visit to Mahamuni Pagoda. This pagoda is home to one of the country’s most revered Buddha images which, over the years, have been covered with gold leaf giving it an almost ‘lumpy’ texture. Mandalay is well known for its skilled craftsmen and as you tour traditional workshops, you will learn more about the city’s cottage industries. Observe the production of wood carvings, kalaga tapestries, and gold-leaf where the techniques remained unchanged from those used centuries ago to craft items for the Royal Court. This afternoon, continue your tour of Mandalay with a visit to Kuthodaw Pagoda, whose 729 marble stone slabs of Buddhist scriptures have earned it the title ‘World’s Biggest Book’. Continue to Shwenandaw Monastery, the only remaining building from the 19th century Royal Palace. This grand teak building is known for its exquisite woodcarving. Head to the top of Mandalay Hill as the sun begins to set to enjoy magnificent views of the city and Irrawaddy River. After breakfast at the hotel depart for an excursion around Mandalay to explore the former capitals of Amarapura, Ava and Sagaing. Begin your morning attending a special ceremony in Amarapura. Witness the alms collection at Mahagandayon monastery, when over one-thousand monks gather to collect their daily meal from the local Buddhists. After this beautiful spectacle, continue to a nearby silk weaving workshop which produces exquisite handmade products. Continue to Ava, the capital from 14th to 18th centuries, and travel by traditional horse and carriage to visit the old wooden Bagaya Monastery and the remains of the town’s Royal Palace and fort. This afternoon, cross the bridge over the Irrawaddy River to Sagaing. Covered with 600 white-painted pagodas and monasteries, Sagaing Hill is widely regarded as the religious center of Myanmar and is home to 3,000 monks and 100 meditation centers. Visit Swan Oo Pon Nya Shin Pagoda and U Min Thone Sae’ Pagoda.As the sun begins to set, walk along U Bein Bridge for fabulous views. This 200 year-old bridge is constructed entirely from teak and spans over 2 kilometers in length. After breakfast, transfer to Sagaing jetty to take by the Cruise to Bagan. 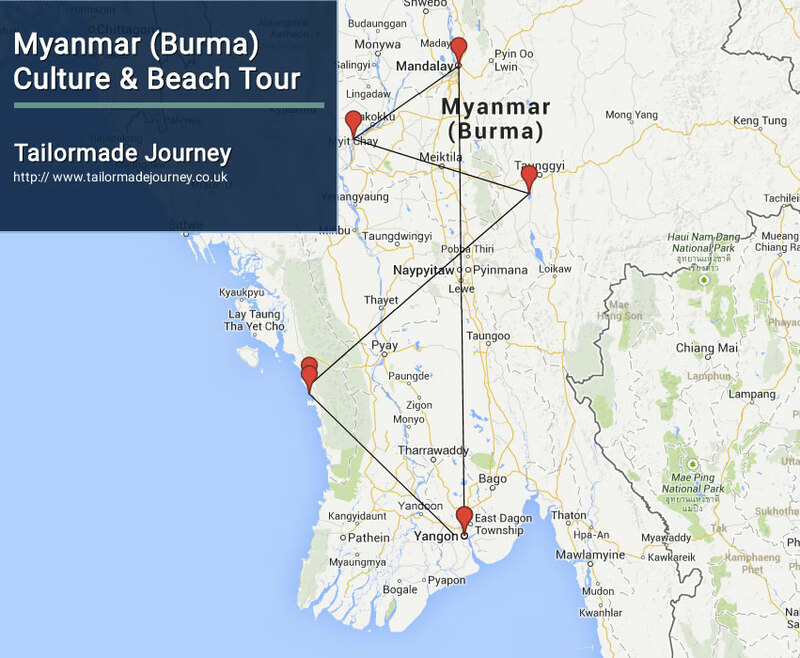 MANDALAY (SAGAING) – CRUISING TO BAGAN. Check-in Time. The embarkation time is at 10.00 hrs at SAGAING jetty. Welcome Cocktail in the Saloon. Downstream to Bagan. The cast off time is at 10.30 hrs. Lunch will be served at 13.00. Cruise all day. In the late afternoon we stop at Yandabo, a village specialize in Pot-Making, where the peace treaty of the First Anglo-Burmese war was signed on Feb. 24, 1826. Moor overnight near the village of Shwe Nann Tint. Early in the morning we proceed Downstream to Bagan. After breakfast (if time permits) we visit another typical river village. Enjoy the sunrise near Bagan. Passengers disembark at Bagan Aye Yar jetty by 9:30 hrs. On arrival, transfer to your hotel. This afternoon, your sightseeing begins with a visit to Ananda Temple, an architectural masterpiece and one of Bagan’s most beautiful temples. Built in the early Mon-style, Ananda contains two unique Buddha images whose expressions seem to change depending on the distance from which the statue is viewed. From here, travel by horse cart for a tour passing Thatbyinnyu, the highest temple in Bagan, massive Dhammayangyi Temple, noted for its remarkable brickwork, and Sulamani Temple. Enjoy an unforgettable sunset over the plains from the upper terrace of one of the temples. After breakfast, begin your visit with a stop at the colourful Nyaung Oo Market where everyday the locals come to buy and sell fresh produce and other goods. Continue to the golden stupa of Shwezigon Pagoda for an introduction in to Bagan’s rich history. Then, visit to nearby Wetkyi-In Gubyaukgyi, a cave temple with exquisite jataka mural paintings and the elegant Htilominlo Temple noted for its fine plaster carvings and glazed sandstone decorations. This afternoon, your sightseeing starts with a visit to a workshop where you can observe the detailed production of lacquer ware, one of Myanmar’s best known and most traditional handicrafts. Continue to Myinkaba village and take a short walking tour to explore Wetkyi-In Gubyaukgyi, a cave temple with exquisite jataka murals and the temples of Manuha and Nan Paya. After today’s tour, board a local boat for a slow cruise down the Irrawaddy River. As you cruise the waters, observe the lifestyle of the fishermen and riverside villagers as well as enjoying the unique perspective of Bagan’s temples. After breakfast at the hotel, drive to Mount Popa located about 48km southeast of Bagan (1 Hour Drive). On the way, stop in a traditional village passing small settlements where men climb up the palm trees to collect the juice to make jaggery or liquor. Visit around the village and observe how to make jaggery (Myanmar’s Candy) and liquor at toddy climber’s hut. After that, resume your journey to Mt. Popa by car. As you leave Bagan’s outskirts, begin the uphill climb to Mount Popa. Mount Popa is an extinct volcano over 1,500m tall and is believed to be the home of the nats, Burmese ancient animist spirits. Thus the volcano’s shrine plays an important role in the culture as the local people travel here to worship the 37 nats. Visit the shrine and join the pilgrims as they climb to the volcano’s top which offers beautiful views of the surrounding plains. Return to Bagan in the afternoon and continue to the rural village of Minnanthu, one of Bagan’s least visited areas. Here you will explore temples such as Payathonzu, Lemyentha and Nandamannya as well as observing the farmer’s way of life. Enjoy spectacular views from the top of Tayoke Pyay temple as the sun sets over the plains. Today you are transferred to Bagan Airport to board flight fir Heho. Upon arrival in Heho Airport a scenic one-hour drive leads to Nyaung Shwe, the gateway village to Inle Lake. Along the way, stop at the wooden Shwe Yan Pyay Monastery which features beautiful carvings and a collection of Buddha images. Upon reaching the edges of Inle Lake, board a private motorboat to head out to Inle Lake, one of Myanmar’s most spectacular sights. Pass villages built on stilts over the lake, inhabited by the local Intha people. Observe the leg-rowing fishermen and see their floating gardens built up from strips of water hyacinth and mud and anchored to the bottom with bamboo poles. Visit Nga Hpe Chaung Monastery, which houses dozens of Shan Buddha Images, but is more famous for its unique ‘jumping cats’ who jump through hoops in the air! Continue to Phaung Daw Oo Pagoda, the lake’s main sanctuary, which contains five sacred Buddha images covered in gold leaf. Explore the local crafts of Inle Lake with a stop at the weaving village of Inpawkhone and a cheroot factory, where the typical Burmese cigars are made by hand. If time permits, there may be time to enjoy a short walk through one of the. After breakfast, visit the lake’s morning market. The market rotates its location around the lake’s villages in a 5 day rhythm and is visited by lake inhabitants and surrounding hill tribes who come to sell and trade their wares. (Note: market is daily except on dark moon day and full moon day). From the middle of the lake, continue down a small canal leading to the Pa-oh village of In Dein. Explore the area on foot, strolling around the village, visiting a local school, and wander through the beautiful Alaung Sitthou area. Climb the covered stair way to the top which is filled with picturesque ancient stupas and has magnificent views of the lake below. After enjoying your visit to In Dein, return to your boat. Continue along the lake for additional sightseeing before returning to your hotel this afternoon. After breakfast drive to the Heho Airport for the flight to Thandwe. Upon arrival in Thandwe Airport, you will be greeted and transferred to Ngapali Beach, a 20 minute drive. Ngapali Beach is a quiet 3-kilometer stretch of white sands lined by coconut palms. The warm, clear waters are perfect for water sports such as snorkelling and there are several small islands around which can be reached by boat. Overnight stay at the Hotel in Ngapali . Morning at Leisure. Later in the afternoon you are transferred to Thandwe Airport to board Flight for Yangon. Upon arrival in Yangon Airport you are met and transferred to your pre booked Hotel. Today you are transferred to Yangon Airport to board flight for Onward Journey.